As of December 31, 2018, we carried a total debt balance (including accrued interest) of €5,665.1 million, of which €1,950.2 million principal amount is related to the Senior Secured Fixed Rate Notes with maturities ranging from July 2027 through March 2028 and €2,747.0 million principal amount is owed under our 2018 Amended Senior Credit Facility with maturities ranging from August 2026 through December 2027. Our total debt balance at December 31, 2018 also included €358.6 million of short-term debt related to our vendor financing program (including accrued interest) and €23.8 million for the outstanding portion of the 2G and 3G mobile spectrum licenses. The remainder primarily represents the capital lease obligations associated with the Interkabel Acquisition. During the first half of 2018, we refinanced part of our outstanding debt at attractive and improved long-term interest rates, while extending tenor. In March 2018, we used part of our cash and cash equivalents to prepay 10% of Facility AB , of which the lender is Telenet Finance VI Luxembourg S.C.A. (“TFLVI”). TFLVI used the proceeds from the prepayment of 10% of Facility AB to redeem 10% of the original aggregate principal amount of its 4.875% €530.0 million Senior Secured Notes due July 2027. In March 2018, we issued a USD 300.0 million Term Loan (“Facility AL2”) at par, under which Telenet Financing USD LLC is the borrowing entity. Facility AL2 carried the same characteristics as the initial Facility AL, which was issued on December 1, 2017. In April 2018, Telenet Financing USD LLC borrowed the full USD 300.0 million under Facility AL2 and on-lent the net proceeds of this issuance to Telenet International Finance S.à r.l., which used such proceeds, together with existing cash, to prepay Facility V, of which the lender is Telenet Finance V Luxembourg S.C.A. (“TFLV”). TFLV used the proceeds from the prepayment of Facility V to redeem in full its 6.75% €250.0 million Senior Secured Notes due August 2024. In May 2018, we issued a new €730.0 million Term Loan facility (“Facility AO”), under which Telenet International Finance S.à r.l. is the borrowing entity. Facility AO carries a reduced margin of 2.50% over EURIBOR with a 0% floor, matures on December 15, 2027 and was issued at 99.875%. Through Telenet Financing USD LLC, Telenet issued a new USD 1.6 billion Term Loan facility (“Facility AN”) with a modestly improved maturity of August 15, 2026. Facility AN carries a reduced margin of 2.25% over LIBOR with a 0% floor and was issued at 99.875%. We used the net proceeds from these new facilities in June 2018 to entirely prepay the following credit facilities under the 2017 Amended Senior Credit Facility: (i) Facility AM (€730.0 million due December 2027, EURIBOR +2.75%, 0% floor); and (ii) Facility AL (USD 1.6 billion due March 2026, LIBOR + 2.50%, 0% floor). In August 2018, we successfully issued and priced an additional USD 475.0 million Term Loan (“Facility AN2”) and an additional €205.0 million Term Loan (“Facility AO2”). 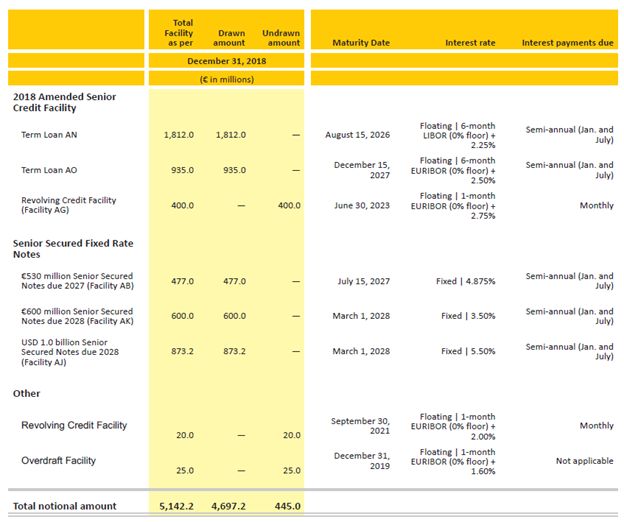 Facility AN2, under which Telenet Financing USD LLC is the borrowing entity, carries the same characteristics as the initial Facility AN, which was issued on May 24, 2018. As such, Facility AN2 carries (i) a margin of 2.25% over LIBOR, (ii) a 0% LIBOR floor and (iii) a maturity of August 15, 2026. Facility AN2 was issued at 98.5%. Facility AO2, under which Telenet International Finance S.à r.l. is the borrowing entity, carries the same characteristics as the initial Facility AO, which was issued on May 25, 2018. As such, Facility AO2 carries (i) a margin of 2.50% over EURIBOR, (ii) a 0% EURIBOR floor and (iii) a maturity of December 15, 2027. Facility AO2 was issued at 98.0%. The net proceeds of these two issuances, together with excess cash and cash equivalents, have been used in early October to pay €598.9 million of the €600.0 million gross extraordinary gross dividend. Excluding short-term liabilities related to our vendor financing program, we face no debt maturities prior to August 2026 with a weighted average maturity of 8.5 years at December 31, 2018. In addition, we also had full access to €445.0 million of undrawn commitments under our revolving credit facilities at December 31, 2018, with certain availabilities up to June 2023.